The most popular screen reader worldwide, JAWS® for Windows® works with your PC to provide access to today’s software applications and the Internet. With its internal software speech synthesizer and the computers sound card, information from the screen is read aloud, providing technology to access a wide variety of information, education and job related applications. JAWS also outputs to refreshable Braille displays, providing unmatched Braille support of any screen reader on the market. Get started with training in DAISY format and a trial version of Freedom Scientific’s FSReader DAISY player software. JAWS installs with an enhanced, multi-lingual software speech synthesizer, Eloquence for JAWS. Languages include: American English, British English, Castilian Spanish, Latin American Spanish, French, French Canadian, German, Italian, Brazilian Portuguese, and Finnish. JAWS can immediately switch from its current Eloquence synthesized voice to a SAPI 5, RealSpeak Solo synthesized voice. The JAWS interactive talking installation makes it easy to get started without sighted assistance. Unparalleled Internet support includes links lists, frames lists, forms mode, reading and navigating HTML tables, navigation quick keys for HTML and PDF documents, PlaceMarkers, Custom Page Summary, Custom Labels for Web page elements, and more! Supports all standard Windows® applications without the need to do special configurations. Enhanced support has been added for todays most popular applications, including Microsoft® Office, Corel WordPerfect® Office, and IBM Lotus® Notes®. Supports Internet Explorer with special features: links lists, frames lists, forms mode, reading HTML tables and graphic labels and more. 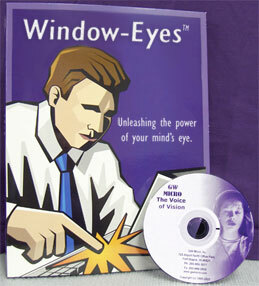 Includes a unique scripting language for further customization with nonstandard Windows applications and proprietary software. New tools for easier customization without the need to write scripts. Outputs to most popular refreshable Braille displays in computer or Grade 2 Braille. 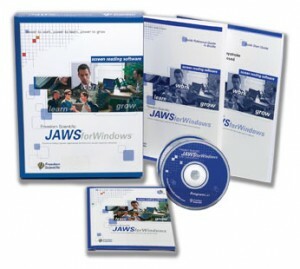 Includes JAWS Basic Training on CD with more than five hours of audio instruction to help users understand how to navigate the Windows environment with JAWS. Support is provided for JAVA applications. JAWS supports remote access via Citrix and Terminal Services. JAWS has been translated into 17 languages worldwide. Multi-user license agreements are available. Software Maintenance Agreement is available, providing two consecutive future upgrades of the software. Multi-user license agreements also are available.